DigiLink :: Managed Networking. At DigiLink, we can put a system in place to manage the network traffic between your LAN and the Internet, custom tuned to your particular business requirements. What are your employees doing on the Internet? If your business is like most businesses, the Internet has made your employees much more productive--in many ways. But an unmanaged Internet connection can also open the door to plenty of reduced productivity and even liability. 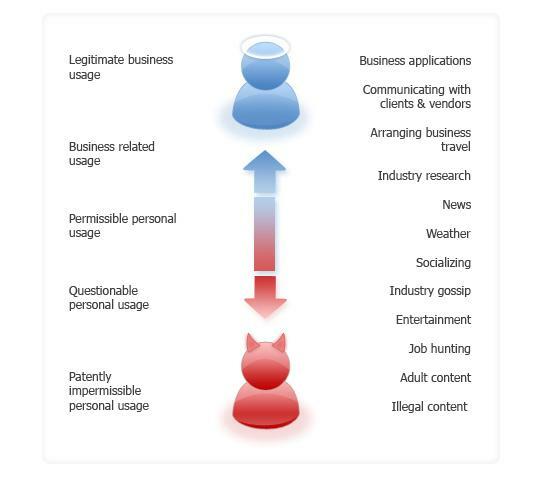 What are some of the downsides to unmanaged Internet use by employees? Block all traffic to sites identified as "adult" in the blacklist subscription database, no matter what. 4 executives, and 2 researchers are exempted, and can surf whenever they want. We can put a system in place to manage the network traffic between your LAN and the Internet, custom tuned to your particular business requirements. Broad categories of sites can blocked using third party blacklists. You can even decide what kinds of sites you'd like to blacklist. You can choose to exempt certain individuals in your organization. You can choose to exempt certain times of day. Isn't this a little bit too "Big Brother"? Without question the management, monitoring, and control of the company's Internet resources is a political issue. However, we are finding that many organizations are realizing that in today's competitive marketplace, it makes sense to manage resources wisely. Because DigiLink's solution gives each business the choice of how to approach this, you can tailor a solution that is right for you and your employees. Some businesses actually find that by outsourcing this function to a 3rd party (DigiLink), it allows the company to distance themselves somewhat from the issue. They are able to state to their employees that a management solution was a requirement in order to minimize exposure to legal liability.